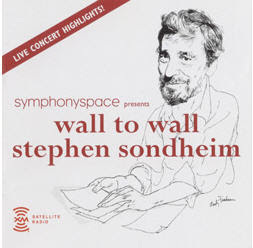 On March 19, 2005, Noah, our friend Vicki and I got up early for Wall to Wall Sondheim at Symphony Space. The day would celebrate Sondheim's 75th birthday with twelve hours of music and discussion of his career. We had the forethought to become members of Symphony Space, so we were able to get in and stay in, unlike the hundreds of fans who could only listen outside on the sidewalk. It's the day that my life of loving musical theatre really changed. Before then, I knew who Sondheim was. I knew some of Sondheim's music. But I didn't KNOW Sondheim. It was twelve hours of Broadway entertainers adoringly performing some of the most brilliant music ever composed, interspersed with discussion of the work by critics, scholars, and people who had worked on the productions. The Master himself was there and took part in some of the talks. We were glued to our seats the entire day and every beautiful moment is committed to my memory. Almost every moment was blockbuster and there were times when I thought my heart would stop from excitement. It became a Love-In of fans and performers alike and nobody wanted to leave. It was the first time I saw Angela Lansbury, Patti LuPone, Elaine Stritch, Barbara Cook and many others perform live. Every time I see a performer now or hear a Sondheim song, I am beckoned back to that glorious day. Today, Stephen Sondheim is 79. So Happy Birthday, Mr. Sondheim. Thank you for those twelve hours plus all of the countless hours of joy I have spent with your music since that day. A very limited and somewhat disappointing but completely necessary live album from the day is available at the NPR Shop.